Today was a greyt day for Pat c I Lie and Kiowa Extracted, they have been waiting several weeks to go home! This family who lives in Hamilton met and fell in love with these pups at our GAGC Family Picnic. The family was on vacation and wanted the new family members as soon as they returned! Kellie, Tanner, Erynn, Allie, Scott and Julie with little Bella who was not real sure of the BIG new friends, the two cats, Izzie and Lillie greeted the new big dogs, hissed and went their seperate ways. Izzie was available for the family photo. 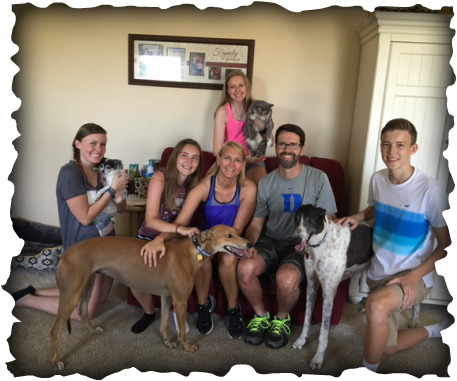 This family who wanted to adopt not one but TWO greyhounds at once. The two hounds walked in their forever home, Kiowa who is now Maycee rolled on her back for belly rubs and attention, Pat C I Lie is now MOOSE enjoyed the extra attention also with this greyt family. We hope to see a lot of them in the future.